Condition and treatment reports for all pieces accepted for conservation. Before, during and after photos taken with high resolution camera. Ultraviolet light examination and photographs. Documentation is very important to us having a record of the conservation performed for future conservators. Specializing in the conservation treatment of paintings, contemporary and old master. A wide range of mediums, including : oil, acrylic, magna, encaustics as well as others. Various supports such as canvas and wood panel. Works on paper all types of media, such as watercolor, pencil, charcoal, pastel, lithographs, etchings and photographs. Sculptures and objects. Various mediums, wood, plaster, metal as well as others. Frame restoration: Repair of gesso frames, gold leaf, as well as other finishes. Conservation Framing: New frames. We also have a variety of new custom frames available. All framing is done with a conservators knowledge and experience. For paintings: Cleaning, varnish removal, consolidating, filling, retouching, vacuum lining to various types of supports, such as linen canvas, honeycomb or Dibond. Sub-support replacement with mechanical or traditional type stretchers. Strip lining, moisture treatments. Surface coatings. Smoke, fire and water damaged paintings. 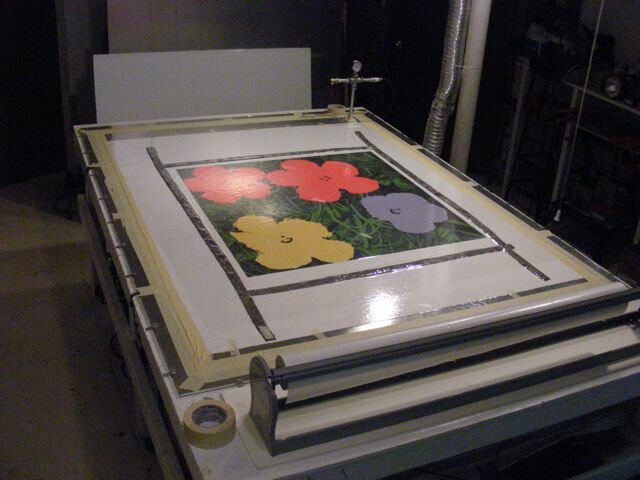 Are equipped with 3 vacuum heat tables to handle small, medium and large works. For works on paper: Foxing, mat burn and general discoloration removal. De-acidification. Mold fumigation and spore removal. Freeze drying for water damaged art and art adhered to glass. Moisture treatments to remove distortions, creases and folds in paper. Suction tables for difficult stain removals. Print and watercolor retouching. Protective surface coatings. Tape removal, board removal. For Photographs: cleaning, retouching, tape and board removals. Freeze-drying for water damaged prints. Mold removal. Archival mounting, de-acidification. For Sculptures and objects: Stabilizing and reattaching loose and broken pieces. Cleaning, retouching, surface coatings. For frames: Stabilizing, cleaning, consolidating, gesso repair, mold-making, retouching, gold leaf repair. For Insurance Companies and adjustors: Onsite examination, condition reports and treatment proposals with high resolution photographs. Specializing in fire, water and smoke damaged artworks. Insurance Estimates available for private collections as well. For Museums, corporate and private collections: On site surveys of collections. Framing, with a conservator’s touch. We have a large selection of frames available. We only use acid-free materials and archival products. Pieces are framed with the condition and restoration history at our disposal. We prefer to frame for our restoration customers only. We can arrange shipping if work cannot be hand delivered by clients. We usually can provide this service free for our gallery customers. We also can arrange crating and shipping world wide through other carriers. While we are insured, we advise our clients that if they have valuable art to obtain there own insurance. We offer insurance on the more valuable works. We have 2 floors with approximately 2,500.00 square feet. We are well-equipped to handle small and large works. Three vacuum heat tables of various sizes largest 9 feet x 14 feet. 2 cold paper suction tables. Fumigation chamber, humidity chamber, spray room. Photography area for high resolution before during and after photos. Ultraviolet examinations and photography. Magnification tools of all types. Many other specialized tools as well. We strive to provide the highest quality conservation and restoration possible. We only use the best archival materials and methods available. Reversibility of the materials used are of the highest concern for us.We fully guarantee our work. Although we are located in East Hampton, we have clients from all points east and west, including many in Manhattan. We travel to and from NYC on a weekly basis. Keep in mind we have clients in many other states and have shipped work from our studio to many foreign countries. We will provide shipping to most locations.